This site is dedicated to the many thousands of ordinary people who decide to build their own personal computers each year -- very often, on their kitchen tables. My goal is simple and remains the same as it was when I first built this site in 2003: I want to present an illustrated, step-by-step guide to building a computer from scratch, in simple language, to help make your do-it-yourself computer-building project as enjoyable, educational, and rewarding as it can be. I also like to think of this site as an educational one. I want to give you enough information to guide you in your planning and thinking, but without doing that planning and thinking for you. The learning comes from the planning, not from the assembly. Anyone can use a screwdriver. Besides, if I had just published a parts list and some basic assembly instructions, then you'd be building my computer, not your computer. And I want this to be your computer. Why should I build my own personal computer? That's a good question. After all, it's a lot easier to buy a computer from a reputable computer shop than it is to build one yourself. Here are some of the reasons. For most of us, the most basic reason is because it's fun. It's a hobby into which we put a lot of planning, and we also take a lot of pride in the finished product. For serious gamers, it's part of the game. A computer is to a computer gamer like a race car is to a race car driver. A well-designed, fast, powerful computer can give them that edge they need to win. You can build your own PC exactly how you want it, as best fits your computing needs. When you build your own computer, it truly is a "personal" computer. Building a PC is an educationally-rewarding experience that can enrich a person's knowledge of and appreciation for applied math, electronics, and physics. Sometimes a home-built computer can be less expensive than a comparably equipped store-bought computer, especially if you start with a barebones computer kit or already have some of the parts. Building computers as a hobby has the potential to lead to a career. In fact, many IT professionals (including myself) got their start by building their own computers. As was mentioned above, when you design your own computer, you can build it to suit the things you want it to do. The days when all computers had to do was check e-mail and surf the Web are over. A high-end smart phone or a decent tablet can do those things (and much more) well enough. 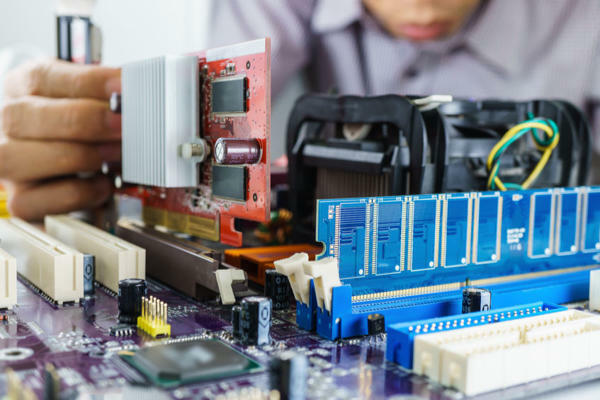 But for gaming, CAD/CAM applications, high-end video editing, and other specialized tasks, there's no better way to get the machine you need than to design and build it yourself. You have to know how to do some basic math. You need some basic hand tools. An inexpensive computer repair tool kit will contain all the tools you need. You have to have a clean place to work with a suitable table or workbench. You need to be able to follow instructions and observe basic safety and anti-static precautions. If you're a child or a teen, you will need a parent, teacher, or other adult to help you and to supervise your work. This site was designed and written for adults, so young people may need help understanding some sections. You need a source for computer parts. I usually buy my computer parts from Amazon because they're reliable, their prices are fair, and they usually have very useful reviews. I also live in a rural area far away from the nearest physical computer store, so being able to buy online is especially helpful for me. Books, videos, and other references may be helpful if you have never attempted a do-it-yourself electronic project before. And finally, you need the parts to build your computer. Check out the computer components section to learn about the different computer parts. The site was redesigned to be responsive on mobile devices. The "m" subdomain was removed and redirected to the responsive site. All content pages were reviewed and most were updated. Some pages were removed because they were hopelessly obsolete. Some other pages were assigned "legacy" status because their content, though obsolete, apparently is still useful because people keep visiting those pages. Still other pages were combined, and a few were split. Many of the pictures were replaced. The overall amount of advertising was reduced, and all but a few display ads were removed from the content sections. Old typos were replaced with new typos. Dead links were revived or removed. Product links and landing pages were reviewed, and the links revised as necessary. This site uses an unusual navigation system. The "Getting Started" link on the top of each page will take you to a map of the site. So if you get lost, click on "Getting Started." You can find your way from there. The links for "Components" and "Software" will take you to mini-maps of the pages dealing with those topics. In addition, some subjects are divided into multiple pages, with mini-maps on the bottom to navigate between those pages. The reason I chose this odd layout is because I know from experience that designing and building a computer is not quite as much of a step-by-step process as one might hope. It involves a lot of back-and-forth, as well. After experimenting with different navigation styles, this one seemed most like the actual process. And after years of the site being live and undergoing several rebuilds, I still think it works pretty well. I hope you find this site helpful, and I hope you have fun.